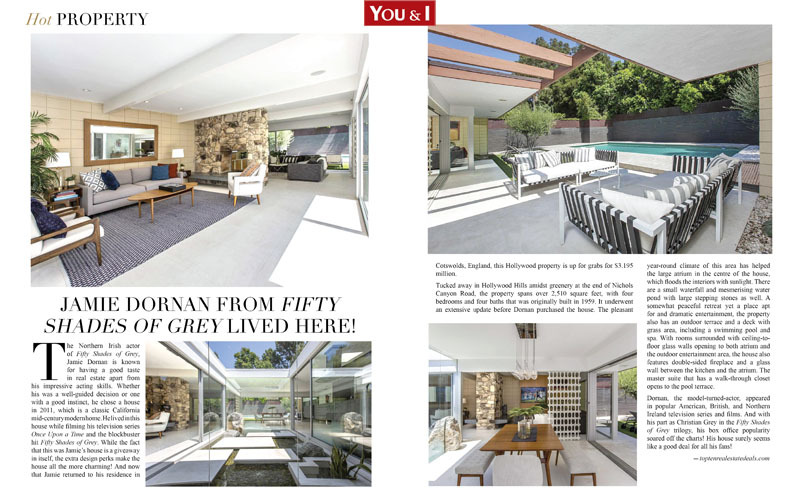 The Northern Irish actor of Fifty Shades of Grey, Jamie Dornan is known for having a good taste in real estate apart from his impressive acting skills. Whether his was a well-guided decision or one with a good instinct, he chose a house in 2011, which is a classic California mid-century modern home. He lived in this house while filming his television series Once Upon a Time and the blockbuster hit Fifty Shades of Grey. While the fact that this was Jamie’s house is a giveaway in itself, the extra design perks make the house all the more charming! And now that Jamie returned to his residence in Cotswolds, England, this Hollywood property is up for grabs for $3.195 million. Tucked away in Hollywood Hills amidst greenery at the end of Nichols Canyon Road, the property spans over 2,510 square feet, with four bedrooms and four baths that was originally built in 1959. It underwent an extensive update before Dornan purchased the house. The pleasant year-round climate of this area has helped the large atrium in the centre of the house, which floods the interiors with sunlight. There are a small waterfall and mesmerising water pond with large stepping stones as well. A somewhat peaceful retreat yet a place apt for and dramatic entertainment, the property also has an outdoor terrace and a deck with grass area, including a swimming pool and spa. With rooms surrounded with ceiling-to-floor glass walls opening to both atrium and the outdoor entertainment area, the house also features double-sided fireplace and a glass wall between the kitchen and the atrium. The master suite that has a walk-through closet opens to the pool terrace. Dornan, the model-turned-actor, appeared in popular American, British, and Northern Ireland television series and films. And with his part as Christian Grey in the Fifty Shades of Grey trilogy, his box office popularity soared off the charts! His house surely seems like a good deal for all his fans!